After having left a mark in 2013 with his eye-catching street art pastings “Wrinkles of the City” all over Berlin, the world-wide famous French artist JR has reappeared in Berlin, with a new inspiring installation. 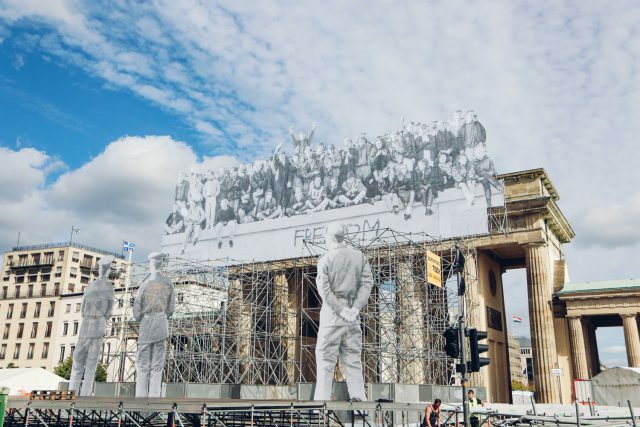 In order to celebrate Germany’s Reunification Day on the 3rd of October, JR recreated a representative scene to commemorate the fall of the Berlin Wall and the celebration of freedom. 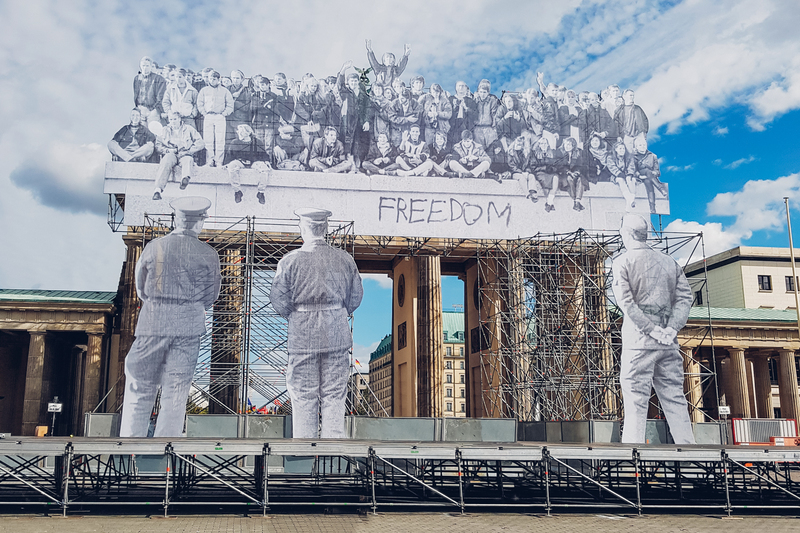 The installation is a photo collage set on the west side of the Brandenburg Gate, whose visual impact is remarkable, given its more than 25 meters high. 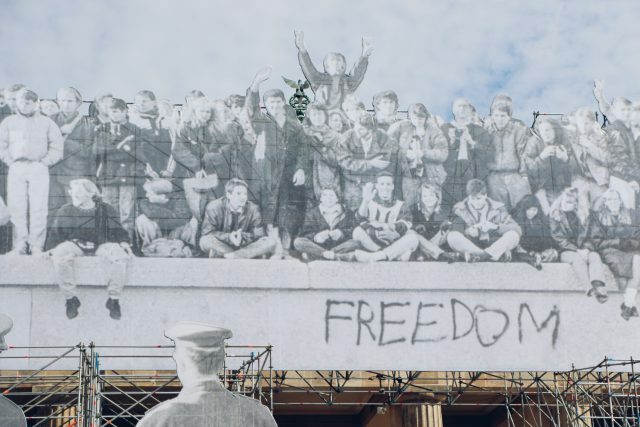 The strength of the work of art is given by its composition: a picture from the Reunification Day representing people standing together on the top of the Wall has been built in front of the Brandenburg Gate. Between them, in the middle of the crowd, a man is raising his hands to the sky, in a sign of victory. The word freedom, written roughly in the upfront part of the Brandenburg Gate, has a central position, not only visually, but also symbolically. 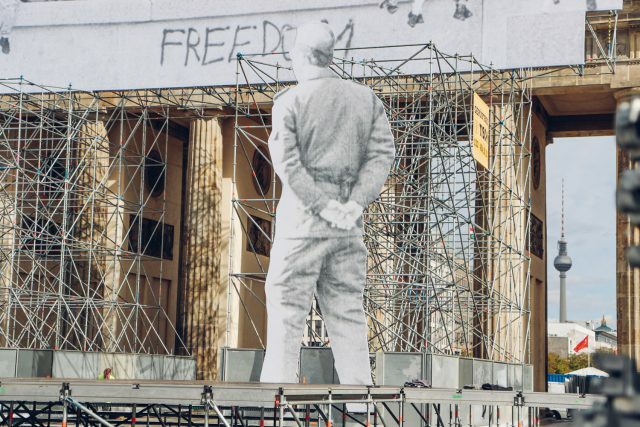 It does not only occupy the main space of the picture but it also symbolizes their newfound inviolable right to live free, after the Fall of the Wall. Part of the installation is also the pictures of three massive border guards, who are represented standing in front of the Gate, looking at the commemorative gathering ahead. 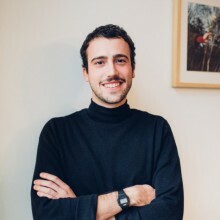 JR has always been using street art as a political statement, bringing social and political important issues to light, like problems of immigration and crossing borders. This time he has surely caught everyone’s attention, bringing back vivid pictures from the history of Germany, which should give everyone a pause for reflection on the importance of the Reunification Day.